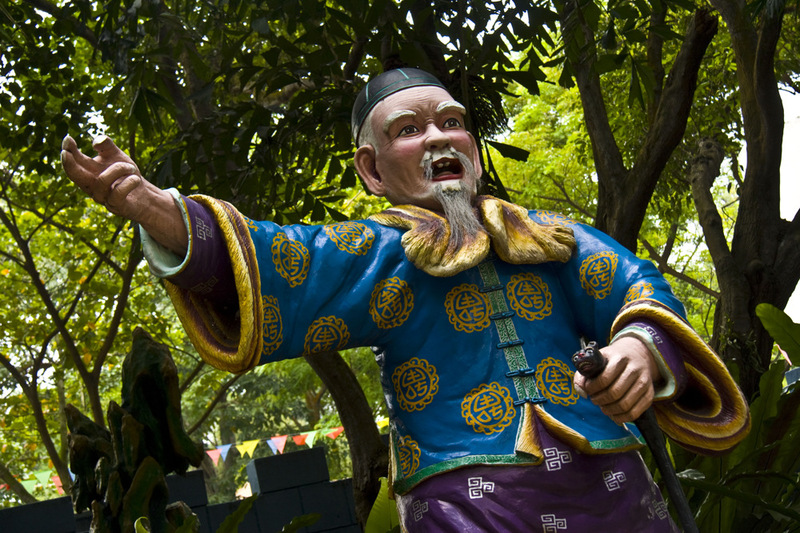 Haw Par Villa is a theme park in Singapore. There are over 1,000 statues and 150 dioramas, mainly taken from Chinese mythology and folklore. Not all statues are exceptional for their realism, but the villa is very impressive on the whole. Built in 1937 by the Burmese-Chinese brothers Aw Boon Haw and Aw Boon Par, the developers of Tiger Balm, the venue was used as a reminder of traditional Chinese legends. The brothers lived here and their vehicle is displayed in the villa today. At some point this place passed to the Singapore government. The best known attraction of Haw Par Villa is the Ten Courts of Hell, which depict life in Hell (according to Chinese mythology). This is set in a suitably dimly lit cave, hence I do not have shots from there. However, there are a couple of statuesque guards, coming up tomorrow. Fine drama in this composition, Ayush. Ayush Basu: Thank you Ray, it was a nice visit here. Ayush Basu: This is a magnificent place and completely free to public, Peter. Nice history lesson. I never really thought about where Tiger Balm comes from. Ayush Basu: I have never used their products but had always heard of them and I too had no idea that this was their residence for a long time. Thank you for the lesson, Ayush!! I had no idea! I like that your angle shows the snake's (?) face! Ayush Basu: Thank you for the comment Elizabeth. All I could find out for this character is that typically he advices people who are lost. And snakes typically are supposed to have wide range of powers, according to Chinese myths. What a wealth for any photographer, Ayush. Did you find out anything about this particular fellow with his snake? Ayush Basu: Easy to get stuck in this villa for hours Lisl. All I could find out for this character is that typically he advices people who are lost. And snakes typically are supposed to have wide range of powers, according to Chinese myths. Ayush Basu: Thank you Chris. They are very old and have been restored several times, I believe. I have no intention of messing with him, Ayush! Ayush Basu: You haven't seen the rest of 'em Ginnie! Wouldn't it be cool if they were animated. Sounds like a very interesting place, Ayush. Beautiful colours in this statue. SC lets you learn so much about other parts of the world. The realism in this statue along with its animation is almost frightening Ayush. He says, come into my village and be mesmerized. Ayush Basu: I certainly stepped forth with that very interpretation, Louis, thank you. I think I would go wherever he was telling me to go. Where have you been? I've missed you around here. Ayush Basu: This character, I am told, is associated by the act of directing lost souls, figuratively more than literally. THanks for sharing this Ayush.. fantastic capture! An impressive chap, Ayush, well captured. Ayush Basu: Quite a few nice ones out there in this place, Frank. Thank you. I have a jar of Tiger balm in my cupboard. I know what life in Hell is like; I go there daily for work So in the theme park do they have roller coaster rides and such like? Ayush Basu: Uh ohh I hope that I did not remind you too much of work then. Perhaps a little rub of Tiger Balm on your forehead might help? There are no rides as such Alan, the stroll through the statues (some are bizarre) is quite an exhilirating ride in itself. Ayush Basu: Thank you, Bill. Some of them are a bit weird too! Looks like he has lost his thumb in combat! Nice dramatic angle. Ayush Basu: Good observation! Combat with a vandal, perhaps, who went back home receiving a crack on the forehead from that snake-staff! What a wonderful statue Ayush! I like your composition. Ayush Basu: Thank you Richard, for the kind comment. This looks like the sort of place where photos abound in great number Ayush. Ayush Basu: Actually there were not a whole lot of people there but I found this place most engrossing. And many photo opportunities as you pointed out. They did a great job here. Love the expression of the man. Ayush Basu: I suppose the duo that created and expanded the Tiger Balm business had no shortage of capital to ensure excellent execution. I can understand why children might be frightened by the figures in this theme park, Ayush. This fellow's expression is not too friendly to say the least.